I didn’t ask James Bradford why he decided to name his company, “The Bike Doctor” because some things just fit too perfectly to muddle the story up with extraneous details. If you live on Hilton Head Island and you ride a bike, chances are you know what I’m talking about, because chances are you’ve visited the venerable, 20-years-young-this-year bike shop at Morningstar Commons on Mathews Drive. It’s always good to have a Plan B. We should all have one, but if Plan A is the Olympics, it’s a really, really good idea. Let’s face it; the odds of getting to the Games are pretty slim, even for an athlete with world-class skills. Bradford gave it his best shot and then put Plan B into action in 1992 when he opened the original Bike Doctor store on the Mathews Drive site where it remains today—almost. In the early days it was mostly repairs and service with a few retail sales. “We were originally running it out of one of the storage units behind the retail buildings,” Bradford said. As the business grew and evolved, The Bike Doctor moved out front to a retail storefront, and now utilizes hundreds of square feet of storage space for warehousing. The need for all of that space is a result of what we might call Bradford’s Plan C, bike rentals, which came about mostly as a result of changing economic conditions. “I grew up doing rentals and it really burned me out,” he said. “When we got our own store, I swore I wouldn’t do rentals. Honestly, though, it’s turned out to be the best move we’ve ever made. “We didn’t do rentals for the first ten years we were in business, but as we got going business changed. Retail changed and the service work thinned out a little bit. We had to make changes to our business, and we got into rentals because it was an additional income that we could count on. Survivability. That’s what it came down to,” Bradford said. Survivability turned into thrive-ability as the rental business turned into a cash cow that didn’t just support The Bike Doctor’s profitability, but helped fuel another growth spurt. “It makes us stronger overall. We can have more inventory in stock so our customers who come in and look are more likely to find what they want. It helps us continue to provide the best possible service, and we’re able to have two stores,” he continued. 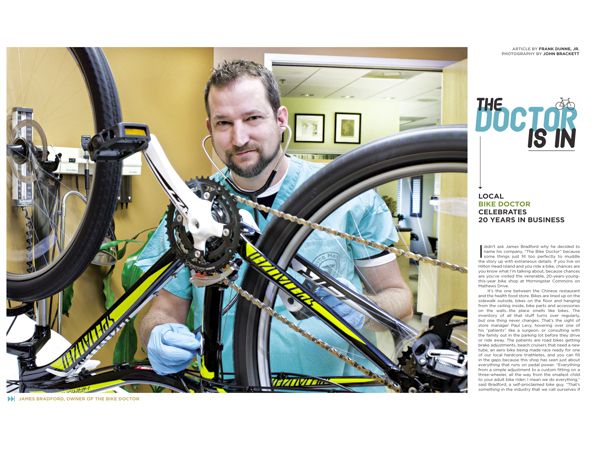 Bradford opened a second Bike Doctor location on New Orleans Road in 2010, which was originally slated to replace Mathews Drive. But the boost from the rental business turned out to be enough to maintain both and allow expansion into yet another segment: wholesale. “We started HH Wheels as a distribution company to supply bikes and parts to other bike rental companies,” Bradford explained. The keys to The Bike Doctor’s success in Bradford’s view are two things that both start with P: product and people. “I believe we have the best product.” On the retail side, he carries every type of bicycle: road, multi-use, dirt, kids, cruisers, in all of their variations and for every rider from casual to professional racers, as well as a full range of accessories. “We try to keep a good stock of product. If we don’t have it, we can get it in a day, unless it’s something really, really special,” Bradford said. But then, really, really special is usually worth the wait, isn’t it? 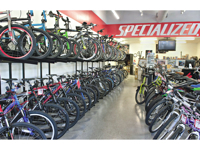 The Bike Doctor is an Official Specialized Retailer, which is a reflection of Bradford’s personal preference. “I think that people who like other brands better than Specialized just haven’t ridden a Specialized yet, in my humble opinion!” he said. Nevertheless, since it is a matter of preference, he also carries other brands like Fuji and Raleigh, and you can find an assortment of other makes in the trade-in inventory. It’s springtime, folks, and time to get that bike tuned up. The Doctor is in, and don’t forget to say Happy Birthday! 160, (843) 681-7531 or 31 New Orleans Road, Suite B (843) 681-7532.